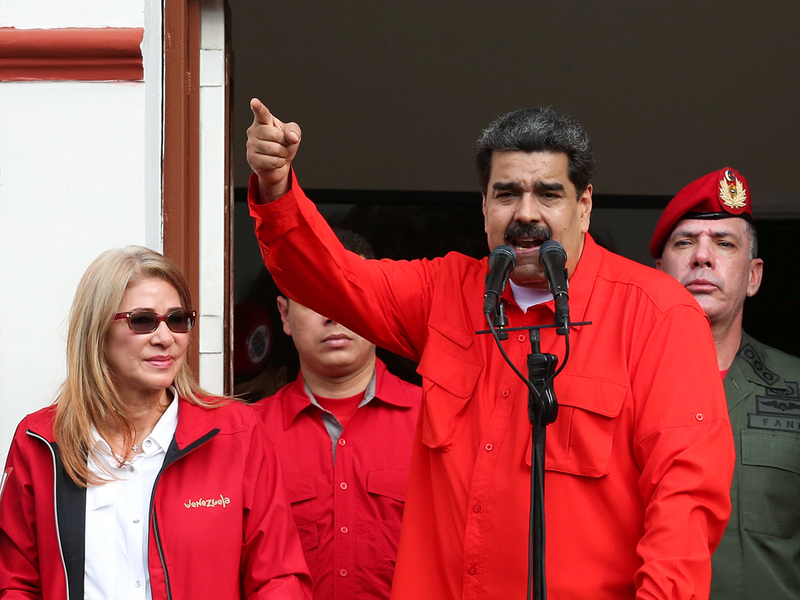 Caracas: Here is a timeline of the major events in the turbulent rule of Venezuela’s Nicolas Maduro. In 2013 Hugo Chavez — Venezuela’s leader since 1999 and initiator of its socialist-inspired “Bolivarian Revolution” — dies of cancer. Maduro, his vice president and appointed successor, becomes president in April that year with a narrow win of 50.62 per cent of votes in a disputed election. A wave of anti-government protests in February 2014, amid a deepening economic crisis, erupts into clashes. Over four months, demonstrations are violently repressed, leaving 43 people dead. Opposition leader Leopoldo Lopez is arrested on charges of inciting the violence. He is released from jail in 2017 but placed under house arrest. In February 2015 the mayor of Caracas, Antonio Ledezma, is arrested and jailed over allegations of plotting to overthrow Maduro. He later flees to Spain. In March Washington orders sanctions against senior Venezuelan officials involved in the crackdown on the opposition. In December the price of oil plummets to its lowest level in seven years, leading to major food and medicine shortages. The same month the opposition takes control of the National Assembly in a landslide election victory. In March 2017 the Supreme Court, considered close to Maduro, assumes the powers of the National Assembly, drawing cries of a pro-Maduro “coup”. The decision is reversed a month later after fierce criticism and international pressure. A new wave of protests begins that lasts four months and leaves 125 dead. In May Maduro launches moves to create a Constituent Assembly tasked with rewriting Venezuela’s constitution. The opposition argues that the new body, which will supersede the National Assembly, is a ploy to cling to power and will be packed with Maduro loyalists. Elections for the Constituent Assembly are held in July. They are boycotted by the opposition and marked by massive protests in which 10 people die. Maduro claims victory but the results are disputed. In August the new all-powerful assembly sacks attorney general Luisa Ortega, an outspoken Maduro critic. As Ortega’s firing is announced, countries in the South American trading bloc, Mercosur, declare the indefinite suspension of Venezuela for “rupture of the democratic order”. The United Nations condemns the “excessive use of force” and Washington imposes new sanctions. Maduro’s socialists sweep regional elections in October, and then municipal elections in December. Several credit agencies in November 2017 declare Venezuela and state-backed oil giant PDVSA in partial default. In May 2018 Maduro wins the presidential election, hailing a “historic record” with nearly 68 per cent of the vote. His challengers reject the vote as invalid and call for fresh elections. The US promptly applies fresh sanctions while Russian President Vladimir Putin congratulates Maduro for his win. In July the IMF announces inflation is forecast to hit 1,000,000 per cent by the end of the year, and says it expects Venezuela’s GDP to contract by 18 per cent amid falling oil production. Days later Maduro announces the removal of five zeroes from the country’s currency. On August 4 Maduro accuses the opposition and Colombia of a failed drone attack during a military parade in Caracas in which seven people are officially reported injured. An unauthenticated statement from a rebel group calling itself the “National Movement of Soldiers in T-Shirts” claims responsibility. On August 8 the Supreme Court calls for the arrest of opposition politician Julio Borges, exiled in Colombia and accused of involvement in the apparent attack. In August the United Nations calls on Latin American countries to continue to welcome Venezuelan refugees, criticising tighter controls on the borders with Ecuador and Peru. In November it says some 2.3 million Venezuelans, or 7.5 per cent of the population, have left the country since 2015, fleeing food and medical shortages and hyperinflation. A month later Maduro accuses the US of directing a plot to assassinate him with the help of the Brazilian and Colombian governments. On January 4, 2019 with the exception of Mexico, the Lima Group — made up of 14 mostly Latin American countries — say they will not recognise Maduro’s second presidential mandate. On January 5 the National Assembly declares Maduro’s presidency illegitimate and says it will form a “government of transition” before organising a new election. On January 10, 2019 Maduro is sworn in by the Supreme Court for his new term at a ceremony attended by the leaders of Bolivia, Cuba, Salvador, Nicaragua and representatives from China, Russia and Turkey. The new term is considered illegitimate by the US and a large part of the international community. On January 23 — the day in 1958 on which the military dictatorship of Marcos Perez Jimenez fell — the National Assembly holds a mass opposition rally against Maduro. During the rally the head of the National Assembly, Juan Guaido, declares himself the country’s “acting president”. Shortly afterwards US President Donald Trump, new Brazilian President Jair Bolsonaro and the chief of the Organization of American States recognise Guaido as Venezuela’s interim president. Canada, Colombia and Peru also give their backing to Guaido, but Mexico says it still supports Maduro.